Offers: Numerous discount deals available from club (resident, corporate packages, winter months, twilight round etc. See website or contact club for detail. Full Hotel and Countryclub leisure facilities (health club, gym, tennis, fishing, confernece facilities, bar, catering). Well stocked Pro shop with hire equipment. Golf practice facilities including driving range. Gatton Manor Golf, Hotel and Countryclub is set in 200 acres of beautiful Surrey countryside (South of Dorking/West of Crawley). As part of a hotel & countryclub, the off-course facilities available to the golfer are excellent and extensive (bars, full catering, private function rooms, changing rooms with showers). The course was laid out in 1969 by the renowned Canadian golf architect Commander John D Harrisis. He made the very most of the beautiful natural terrain, lakes and streams to produce a handsome mature woodland layout, where no two holes are the same, water comes into play on 10 of the holes and the 18th is considered one of the best finishing holes in the area. Golfers and golf groups are always assured a warm welcome (contact club to make arrangements). Gatton Manor GC (& hotel), is a par 72 6,563 yards par 72 from the white tees. However it is a 6,026 yards par 70 from the yellow tees, as played. 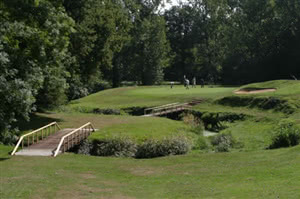 It is a parkland course in Ockley, near Dorking, Surrey. The course is a very tricky challenge, with significant elevation changes, blind shots (for the shorter hitters), doglegs and deep bunkers. The tee shots on the 3rd and 10th holes are particularly problematic for medium hitters, with water awaiting. Also the uphill approach to the 18th green is particularly difficult if playing up from the rough on the right hand side of the fairway. The 6th hole (index 1) has the most challenging blind approach to a raised green protected by overhanging trees, a deep brook/pond below the green and bunker above to the right of the green. Because the course is scheduled for closure at the end of October 2017, it was evident that the course was not being maintained to its best condition, in particular the fairways were not being cut to a proper level. This had a detrimental impact on the length of drives and the general run of the ball approaching the green and off banking etc. The above said, the greens were in good condition though were playing slower than they ought to for the time of year, again not being cut often enough or close enough, or being ironed. A lack of maintenance resources I presume! The 'golf only' green fee paid was excellent VFM, particularly for a bank holiday weekend. TSGers probably know that the owners plans to close the course for a two year period for hotel, leisure, health and course upgrades were rejected by the local planning committee so the latest news is that the owner has put the course/hotel on the market for sale but the course will nevertheless close as scheduled rather than carry on until a buyer is found. Let's hope that there is a good outcome sooner than later or none at all. The course is a great layout which only requires a bit of TLC to bring it back up to a high quality. I thought Gatton Manor was challenging. You needed to be quite a big hitter to get to the greens in regulation. The course was in great condition and I would definitely go back there. The course is at its best, the staff is friendly and welcoming , the food is excellent . It is such a shame that it closing at the end of October for a new development with its private golf course. It will be then a totally private affair, maybe some Visitors fee in the region of £200 , no one really knows . The locals are devastated to loose such a gem of a course. If you get the chance to play @ Gatton Manor before October , please do it. Excellent value for money and a course that will tease you and please you. Beautiful Course On A Sunny Sunday !! We drove down the long drive to the clubhouse on a warm, sunny Sunday morning in Mid October to what looked like a beautifully, well maintained course, we weren't disappointed. Every hole was superbly manicured, tee boxes, fairways & greens were all in fantastic condition. A lot of the holes are quite tight, especially as you get nearer to the greens, as they are well guarded by overhanging trees, well placed bunkers and the occasional drop of water, anything wayward on your approach will see you in one of these hazards. I didn't do the course justice, but I will definitely be back to have another go, especially at the member's guest rate of £22. There's a well stocked pro shop and the clubhouse is clean & fresh with a television for all those sports fanatics out there. The bacon rolls are also good quality if you're looking for a spot of breakfast before your game. Overall, don't miss playing this gem of a course in Surrey, but make sure your "A" Game is ready to take it on. It seems that I just see the good everywhere I go as every new course I go to I can't help but sing its praises but hands down this is the best course I have played, ever. I got a deal off teeofftimes for £20 wih a normal round costing £45 on a Sunday this was a great deal. You drive down a country lane and pull in and you know you are going to be playing a great course. The range allows you to play off grass, nice putting and chipping green round the back, club house is warm and friendly although the club shop is a little room off it and sells the basics. I was told before to leave my driver in the car but this is rubbish, loads of holes to let rip and I actually found it fairly forgiving on my odd wayward shot, still lost a few though. Tee boxes, fairways and greens all in good condition and the sand was best i have seen in a long time. Just as well as I'm not sure i missed a bunker!! Every hole was great fun to play and although I could comment on every hole the 6th was terrific, stroke index one for a reason and the 18th has got to be the prettiest hole I have ever seen, and blooming hard too!! Nice little half way hut. Order your coffee, play the 10th and walk back up to the 11th and pick up your goodies. I won't go on. Its a fantastic course and I will be looking out for deals to play again and again. I'm not sure i would play it without a deal as pretty expensive at normal cost, but still probably worth it but why pay full money when you don't have to. Didn't eat here but food looked alright, all the beers etc you would want, nice seating area outside. Loads of parking close to the clubhouse. Take a trip down here, you won't be disappointed.